A state panel is considering an unprecedented move to hand over the management of an entire school district to an outside, private group. 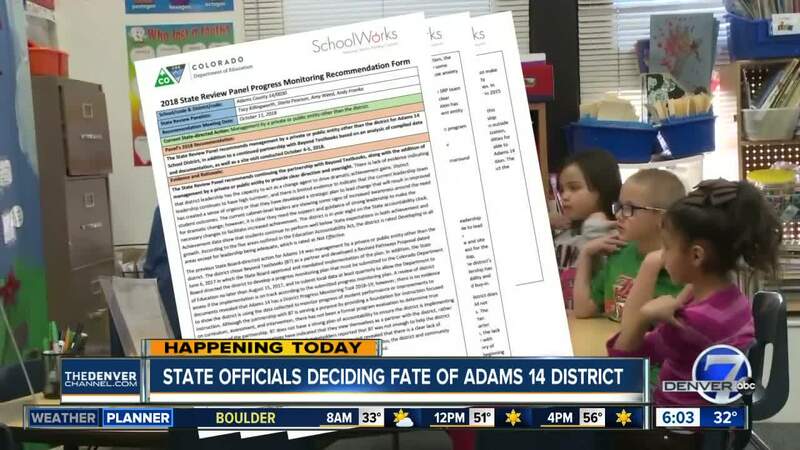 DENVER – The Adams 14 School District in Commerce City will have to turn over full management to an external organization in an unprecedented move by the state board of education to try and fix the district’s performance issues. The order from the Colorado State Board of Education on Thursday came after two days of public comment from district leaders and community members, as well as recommendations made by an independent review panel. The district and its high school have for eight straight years received the two lowest ratings in Colorado’s school accountability system , which measures test results, academic growth, graduation and dropout rates, among other things. Last year , Adams 14 partnered with Beyond Textbooks at the board’s orders to try and help improve some of those issues. But ratings did not improve. Adams 14 will have 90 days once the board comes to an agreement on which private or public organization will manage the district to agree on a contract with the organization. If a contract isn’t agreed upon within those 90 days, the district will become unaccredited. The board is expected to vote on an order that will give the district more guidance on an agreement in the next two weeks. There are 13 schools and about 7,500 students that attend the district. According to state testing results, one-in-five fifth graders are reading and writing at a fifth-grade level and just one-in-ten are at their proper grade levels for math. In addition to the decision on Adams 14, the state board of education on Thursday also told Pueblo City Schools to find an outside organization to manage Heroes Middle School and Risley International Academy of Innovation – which serve a total of about 600 students – which have both also underperformed. The district said it was planning to enter a contract with an organization by March.